When analyzing an ad, a flyer, a magazine cover, a package or other communication, it is always of utmost importance to find out in which sequence and intensity visual and textual elements are perceived. Because only if the intended message actually reaches the consumers they will take the offer into consideration. 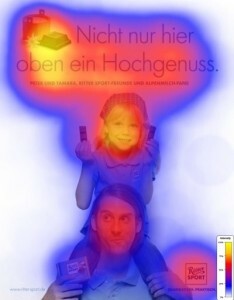 Subjective and largely unconscious information processing, in which visual effects play a prominent role, can be measured by eye tracking. With the help of eye tracking it is possible to gain objective data about the mostly subconscious activities of perception, attention and information processing. This data can be combined with classic interviewing techniques to facilitate a complete interpretation with actionable rec-ommendations. Using the patented Spotlight Viewer it is possible to conduct online eye tracking with large samples in short field time at attractive cost. The visual that is to be examined is shown on screen in the blur of the peripheral vision. The respondent can explore the visual by moving the mouse. Instead of moving the mouse cursor the test person moves a so called perceptual map – that matches exactly the physiological and anatomic circumstances – over the visual. Only the visual information of a small area around the position of the cursor is shown in high definition. The bigger the distance from the cursor, the more blurred the visual is rendered. The analysis of the measurement shows accurately how long and in what intensity different areas of the stimulus, e.g. 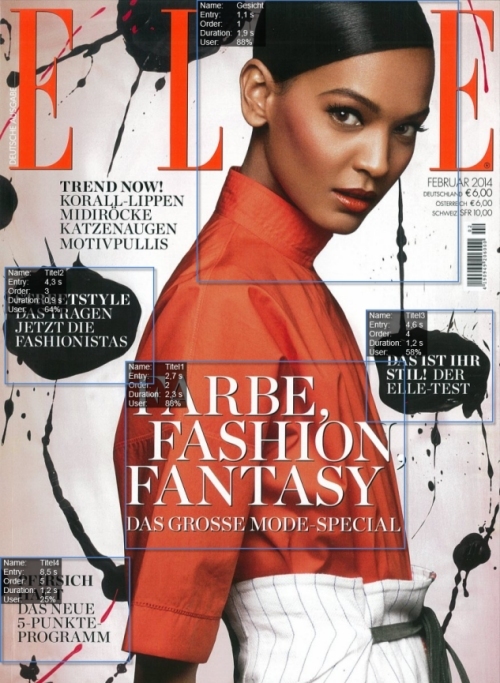 a mag-azine cover, an ad or a package design have been looked at. In order to accom-plish that, sections of the image that are of interest can be freely defined (Areas of Interest, or AOI). The measurements can be used to deter-mine exactly how often and how long and in what sequence certain areas were viewed. For example, it can be measured if and when a headline is read, and whether a visual element draws the attention away from the headline or leads the spectator towards it. The Spotlight Viewer® not only measures the frequency and duration of viewing AOIs. In addition the sequence of the viewed image sections is shown. 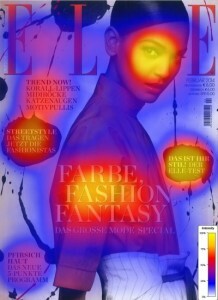 In this way it can be analyzed which ele-ments of an advertisement are seen within the first second(s). Thus, you can draw clear conclusions on the effect of (alleged) eye catchers. Because online eye tracking with the Spot-light Viewer® can be performed on any computer, anyone can run this test on their PC or Mac at home. Different from classic eye tracking, large samples can complete this test within a very short time by using this method. Which elements do young men perceive compared to what young women? Are there differences between brand users and users of competitor products? Large Samples: Large numbers of interviews and comparisons of subgroups can be generated. Lower Cost: Different from traditional eye tracking the new method can be used without expensive technology and operating specialists. Shorter Field Time: Online eye tracking requires less organizational, methodo-logical and technical effort and can be executed with commercially avail-able computers. Results are available faster, even with large samples. No Test Lab: Respondents can participate in the test via Internet, for example as members of a panel. They can do it wherever they have access to a PC or Mac. So they can do it in the familiar surroundings of their home. Clear Interpretation: Clear conclusions on the strength of attention of single elements through the measurement / calculation of areas of attention and sequence / duration of looks. Combinability with Classic Interviewing Techniques: After the online eye tracking respondents answer questions about brand recall, purchase intention and image. Questions on other topics can be in-serted before or after the Spotlight Viewer® module. Our reporting provides clear recommendations and optimization suggestions in addition to a detailed analysis. Depending on your needs, we offer advice and recommend the ideal combination of eye-tracking and other classic observation and survey tools. Because the goal is clear: Make your communication more successful and more attractive!